Need ideas for unity candles? 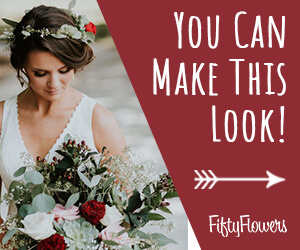 Why not create a gorgeous flower design as a stunning centerpiece for your church wedding ceremony? Don't feel constrained by the colors or flowers shown in this tutorial . . . you can easily change the flowers, colors and greenery to suit your own wedding palette. Lighting a Unity Candle after your wedding vows has been spoken has become a beloved tradition of bride and grooms for many years. Normally there is a large pillar candle in the center, with two tapers on the sides, symbolizing the joining of two separate individuals into one. Often the side taper candles are lit by the mothers (or other representatives) of the bride and groom. After coming down as the early part of the processional, the mothers continue up to the altar area and light the two tapers. This can be changed to have the children of the couple light the candles (if they are old enough to trust with handling open candle flames). There is sometimes a problem with the unity candle lighting. This is usually caused by the wax melting and pooled at the top of the side tapers. When the couple pick up the side candles to light the unity candle, the hot wax pours on top of the unity's wick, making it difficult to light. I usually suggest that small utility candles be laid aside near or behind the unity candle decorations. Instead of pulling out the lit candles, both the bride and the groom will lit their smaller utility candle from the lit tapers. Then together they light the center pillar candle, blow out the small utility candles and then continue with their wedding ceremony. Another suggestion is that you purchase a small home fire extinguisher and store near the open candle flames. Be sure to alert at least two of your wedding attendants where the extinguisher is at. The need is very rare, but at the very worst you'll still have a small kitchen extinguisher to store in your own home after your wedding is over.